Fully air conditioned , 9KVA generator, TV/DVD. The Leopard 46 offers exceptional performance and speed on the water thanks to a powerful rig, stepped hull design and light displacement. A raised helm station is located in the hard top roof with open access to the cockpit and all controls lead aft for excellent visibility and resulting in a cat that is extremely easy to sail, even with a limited crew. The Leopard 46’s overall performance and ease of handling has earned it ‘Boat of the Year’ nominations from Cruising World magazine. This boat will comfortably accommodate 8 – 10 crew. Many thanks for an absolutely fantastic holiday experience in the Whitsunday Islands. Sandy and Rose in the office were always very friendly and efficient in helping us organise our trip. Brian, who briefed our party of eight gave us great practical and itinerary advice. Our wonderful catamaran “2Keela” was beautifully prepared and positively gleamed at us when we first stepped on board! We had all been planning and looking forward to sailing the Whitsundays for many years. Our trip easily met our expectations. 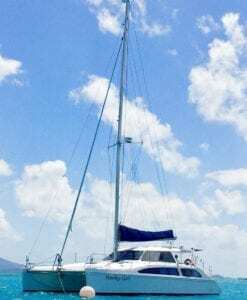 2Keela was a brilliant boat and accommodated our large group easily, the sailing was wonderful, the islands and anchorages varied and beautiful, the fringing coral reefs colourful and packed with fish, the walking well graded and rewarding with fantastic views. We saw loads of turtles, some dolphins and even a couple of dugongs! I would go again tomorrow if I could! Thanks again for one of our best holidays ever. One of the most beautiful and enjoyable boats I have ever been on. Myself, Wife, daughters, mother, and mother-in-law took this out in January 2016. Incredibly responsive, light as a feather, Everything was in good shape, air conditioning was a relief in the evenings once we had anchored for the night. Underwater lights were perfect for lighting up the underwater mysteries at night. All switches, buttons, knobs, and everything else was well documented and easy to find. I personally loved having the map on the main table inside to help me decide where we were going as I was having my coffee each morning. Plenty of space for water for the entire trip, and the refrigerator kept everything cold. I never thought I would want to own a boat, but this trip changed my entire thinking about what was possible in a great sailing experience. Everyone who saw this boat wanted to come visit and asked a lot about her. I long for the day when I can come back and go for another ride of joy with this one.